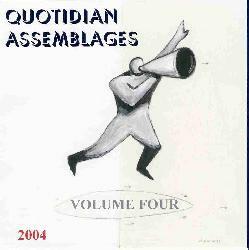 Various Artists - "Quotidian Assemblages: Volumes 3-5"
Here we go with 3 more volumes of Hal McGee's Quotidian Assemblages compilations, the instructions to contributors being to create an audio piece consisting of recordings of common everyday sounds from your life. No added instrumentation or synthesizers, or prerecorded loops or samples. 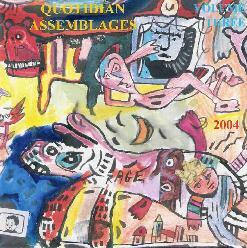 How you treat, assemble, collage, effect, destroy and manipulate those daily sounds is totally up to you. Volume 3 includes 19 contributors, mostly from the USA. The artists make creative use of abstract sound waves, rumbling drones, percussives, ambient sound collages, cacophonous rattling, noise assaults, and all manner of everyday activity: human, rail yard, ocean floor, machine shop, and much more. Among the artists who particularly grabbed me was Etat Des Stocks (Belgium), who contribute an interesting blend of human hustle and bustle, voice samples, power tools, and a gaggle of birds. It sounds crazy if you're just reading this but these folks bring it all together in creative ways. Tommy Birchett's (USA) crazed high volume tape manipulation is wild as hell. Start, stop, start, stop... whoaaaa... my head is spinning. I'd like to hear more from this guy. Final Cut (Belgium) offer up a spacey sound-art blend of alien weirdness, warbling voices, buzzing bees and noise waves, plus a slow bass line that adds a drugged rhythmic pulse. David Aronson's (USA) track is another fun melting pot of sonic bits and pieces. Mike Mangino's (USA) entry is an avant-garde space excursion that I enjoyed. Mangino gets an interesting pattern going in a mere 3 minutes. I'd like to hear this developed more fully. Violet's (USA) track starts off with a blend of harsh ambient space and flying saucer engine room activity. But about halfway through a noisey factory atmosphere takes over for the remainder. I really liked where this was going in the first half and would have liked to have heard that theme developed further. And Courtis (Argentina) is another artist whose cool spacey urban atmospherics merit a more extended workout. Volume 4 consists of 12 entries from around the world. We've got interesting examples of mechanical sounds and clatter, urban field recordings and use of conversations, and abstract drones and aggression. Highlights include Anne Hege (USA) who incorporates field recordings into a rumbling aquatic sounding ambient stew, and Etsetera (Puerto Rico) creates an interesting rhythmic patterns amidst a factory-like atmosphere. Other contributions of note include Alexander Zagorodnyi's (Russia) intense, chaotic, spaced out sound-art assault. It's like an undersea avant-garde alien ensemble. Microwave Windows (Florida) employs similar sound pandemonium, though this one is more like an experimental sound collage representation of a Star Wars battle. Fred Yarm's (USA) entry was my favorite among the more abstract tracks. It's a sound-art piece that makes interesting use of running water. And Napalmed (Czech Republic) contributes a darkly atmospheric mood piece. We're down in the sewers and workman are busy off in the distance, unaware of the alien presence in their midst. 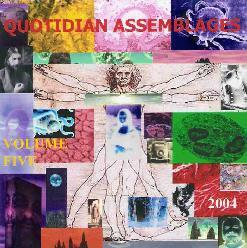 Volume 5 has 11 entries, again with lots of interesting use of everyday sounds, human activity and clatter. Among the highlights are Resonan (Netherlands), who offer up an intriguing blend of clatter, noise waves and creaking doors. It's hard to describe but I love the way they utilized the creaking door. Makes it sound like some kind of avant-garde haunted house. IDX1274's (USA) entry features a chaotic noise assault along the lines of Frankenstein's laboratory, combined with rumbling drones. I always enjoy the sounds of the city and Adam Bohman's (UK) contribution sets spoken word poetry against a backdrop of daily activity at a South London market. w.i.t. (Australia) brings together pulsating machinery, frenetic tonal patterns and other miscellaneous sounds, along with chirping birds. I like the contrast between the sounds of nature and the machine world. Homogenized Terrestrials' (USA) track creates quiet but wrenching noise textures along with a continually rising and falling wind-like sound. Another impressive example of contrasts working well together. But the best example of creatively manipulating contrasting elements comes from Later Days (USA), who combine percussion improv with ambience and a gaggle of giggling and cooing babies, all efx'd into a totally freaky mish-mash. Pyrogliphix (USA) contributes a spaced out mixture of bubbling underwater activity, busy machine shop commotion, and alien efx. Excellent job of creating emotion and building intensity. And SourceCodeX (USA) takes us even deeper into avant-garde space with a combination of soaring and pulsating ambient space waves, cosmic efx and sound collage clatter. The word from Hal is that Volume 5 will be the last in the series. But in a short time he's assembled an impressive range of expressions in sound from around the globe, much of it demonstrating real imagination in how the various sound elements are brought together. Sound-art fans will find much to enjoy in these volumes.